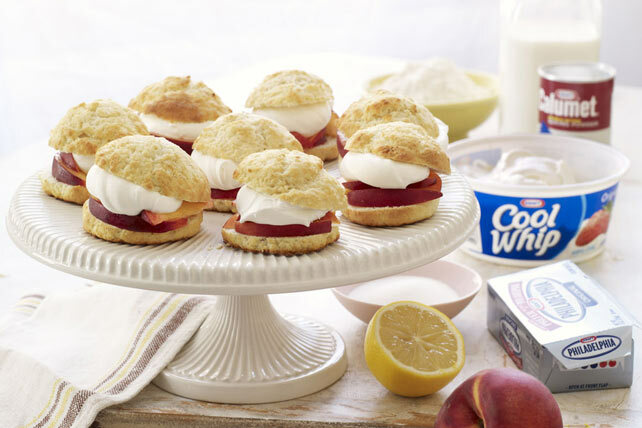 Easy-to-make homemade shortcakes are filled with sliced fresh peaches and COOL WHIP Whipped Topping - the perfect dessert recipe to end any summer meal! Mix flour, 2 Tbsp. sugar, baking powder and zest in large bowl. Cut in cream cheese with pastry blender or 2 knives until mixture resembles coarse crumbs. Stir in 1/3 cup milk until mixture forms dough. Use floured hands to divide dough into 8 balls; place, 3 inches apart, on baking sheet sprayed with cooking spray. Flatten to 1/2-inch thickness; brush tops lightly with remaining milk. Sprinkle with 2 tsp. of the remaining sugar. Bake 12 to 15 min. or until golden brown. Meanwhile, toss peaches with remaining sugar and lemon juice. Cool shortcakes slightly; split in half. Fill with peach mixture and Cool Whip just before serving. Mix 1/4 tsp. ground cinnamon with the 2 tsp. sugar used to sprinkle over biscuit dough before baking. Prepare using 1/2 cup (1/2 of 250-g tub) Philadelphia Cream Cheese Product.